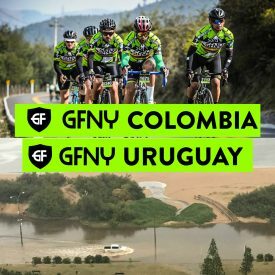 NEW YORK CITY, March 22, 2018 – GFNY Colombia was a showcase of Colombian cycling talent on Sunday, March 18. Nearly 2000 riders from 25 countries lined the roads of the scenic, tranquil town of Guasca, Colombia, 40km from Bogotá, as they prepared for the start of the 4th annual GFNY Colombia presented by Sura. With cycling being the country’s #2 sport, the peloton was at fever pitch on race morning. From the outset, two fearless riders,Carlos Trujillo and David Gutierrez, attacked and worked up a lead of two and half minutes from a chase peloton of 100 riders. It was a brave but fruitless move over such a challenging route. As the two riders approached the featured climb up the 3365-meter La Cuchilla, the highest and most demanding climb of all GFNY World races, their lead had reduced to two minutes. One quarter into the climb, three riders, Antonio Donado (Rionegro, Col), David Ibanez (Cajicá, Col) and Juan Moreno (Bogotá, Col) who broke away from the chase peloton, caught up and overtook the two leaders. After such a brave race, Trujillo (Medellín, Col) and Gutierrez (Medellin, Col) could not react to the trio’s challenge and came across the line in 4th and 8th respectively. Donado, David Ibanez and Moreno continued on, with Donado taking the win by almost a minute from David Ibanez in 2:56:55. Moreno rounded out the podium a further minute back. In the women’s race, Paola Valbuena from Bogotá, Colombia controlled the race with a strong ride and took the win in 3:16:36. The battle for second and third was a close call with Alejandra Cadena of Bogotá, Col edging out Liliana Sanchez (Medellín, Col) for second by just three seconds. 10% of finishers in each age group in the long route qualified for the Racer Corral at the 2018 Campagnolo GFNY World Championship in NYC on May 20th. Due to the weather conditions of orange alert in Punta del Este, the organizers were forced to cancel the competition, to avoid the severe risks inherent in the lightning storm that lasted the whole day. Several roads were flooded and impassable. GFNY is the global cycling marathon brand with events held in NYC, Bali-Indonesia, Brazil, Chile, Colombia, Costa Rica, Germany, Samosir-Indonesia, Jerusalem-Israel, Cozumel-Mexico, Monterrey-Mexico, Panama, Poland and Uruguay. The 8th annual Campagnolo GFNY World Championship New York will be held on May 20, 2018. The race features the world’s most international peloton with riders from over 90 countries. Athletes take on a challenging 100-mile route from NYC to Bear Mountain to Fort Lee to compete against each other, the clock and themselves in a personal endurance challenge.